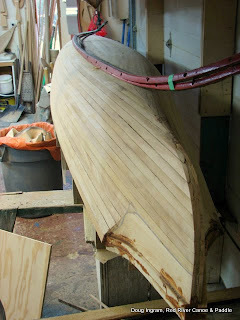 My single Baidarka project is all planked up and mostly faired. It will have to sit and wait till I have some more time for it. I will need to do the final refinement of the fairing, then fill any plank seams and glass it. This project used some old strip planking that I bought second hand. It looked better in the bundle, but after inspecting the individual strips it became apparent that some, actually quite a lot, of the milling was less than good. What this all means is that the strips did not match as well as they should have, and that there are more gaps than I would find acceptable for a bright (clear) finish. I was planning on painting the hull anyway, so no big deal. I am still working out what I plan on doing with this kayak. I do intend this one to be a developmental project. That is, I will be trying out a variety of trim features, and I want the freedom to make changes over time. I am thinking that I will take a mold off of this hull and use it to build composite hulls and deck them with wood. That can always change. I may choose to do nothing except paddle it! Posted by Doug Ingram at 8:56 a.m.